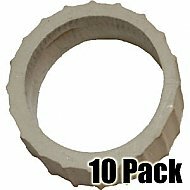 Buy 10 or more and save! No drips, no wilts, the safest way to have a real flame! 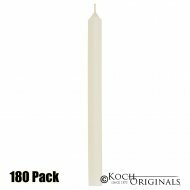 Our 12'' mechanical candles are great for rental stores and any other candelabra application where a safe, but real flame is needed. 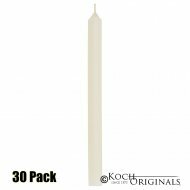 Our mechanical candles have a spring that gently pushes upwards on the small wax candle refill inside (sold separately) so you always have the perfect flame, but none of the hassles. 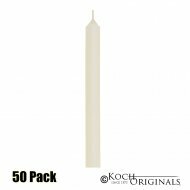 Mechanical candle quantity discounts are at 10 pieces and at 50 pieces (separate items). 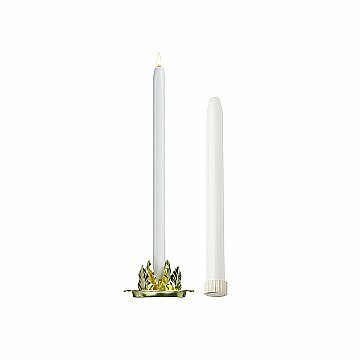 Our mechanical candles are 3/4" diameter and our rubber gripper ring is included if you need to go to 7/8'' diameter. 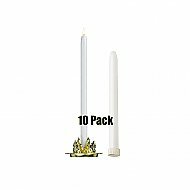 Mechanical candles won't drip, wilt or melt down and work great in candelabras. 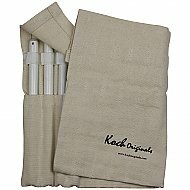 Help minimize clean-up problems and damage to expensive decorating equipment, carpet and linen because under most draft conditions our mechanical candles won't drip. Safe because they will not burn down into flammable decorations, drip free and reusable! Refills available (CR-250 or CR-180). Available in white only.